Graphical view of genomic region to which issue is mapped (red box). Note: graphical views are provided for all mapped locations in the previous and current assembly versions. For example, HG-1291 has been mapped to chr. 3 and an alternate locus scaffold in GRCh38.p2, and to chr. 3 and a novel patch in GRCh37.p13. Use the radio buttons to toggle the display between the different sequence locations. Figure 1. GRC Issue page for HG-1291, with page features highlighted. In this image of HG-1291, review of the Genes and Alignment tracks reveals two exons in a region of the alternate loci that has no alignment to the chromosome (arrow and circle). This annotation supports the description in the Issue Summary fields. You can further configure the tracks or upload your own data files to the graphical view by clicking on the "Configure" button at the top right of the viewer (red box). Figure 2. Graphical view of NW_003871060.2, the GRCh38.p2 alternate loci scaffold to which issue HG-1291 is mapped. The exons captured by the additional sequence in the scaffold are highlighted. If you have questions about any of the issues you see, please contact the GRC and reference the issue number. If you know of a genome issue that isn't found on these pages, please report the issue to the GRC. GRC "Genome Issues under Review" webpage update! 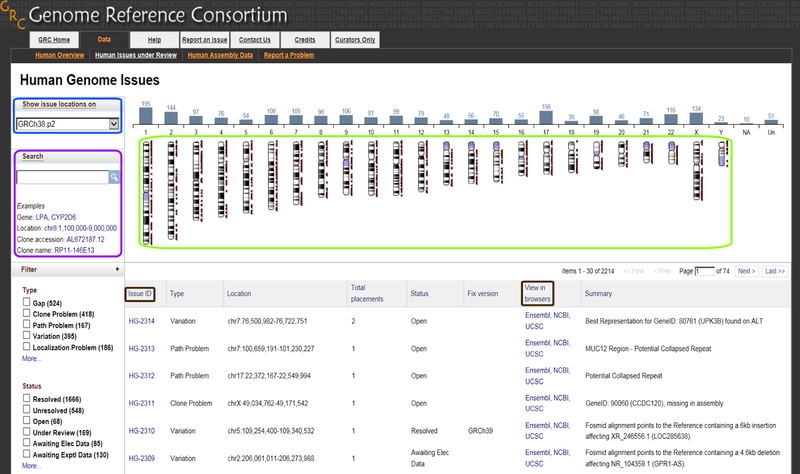 Do you know how to find genome issues on the GRC website? To get started, select an organism from the top of the GRC homepage, and in the corresponding organism overview page select the link for "Issues Under Review". These pages provide you with the latest information about potential problems and other issues related to the human, mouse and zebrafish reference genome assemblies that the GRC are working on. Recent updates to these pages make them more interactive, informative and easier to navigate so you can pinpoint issues relevant to your research interests. 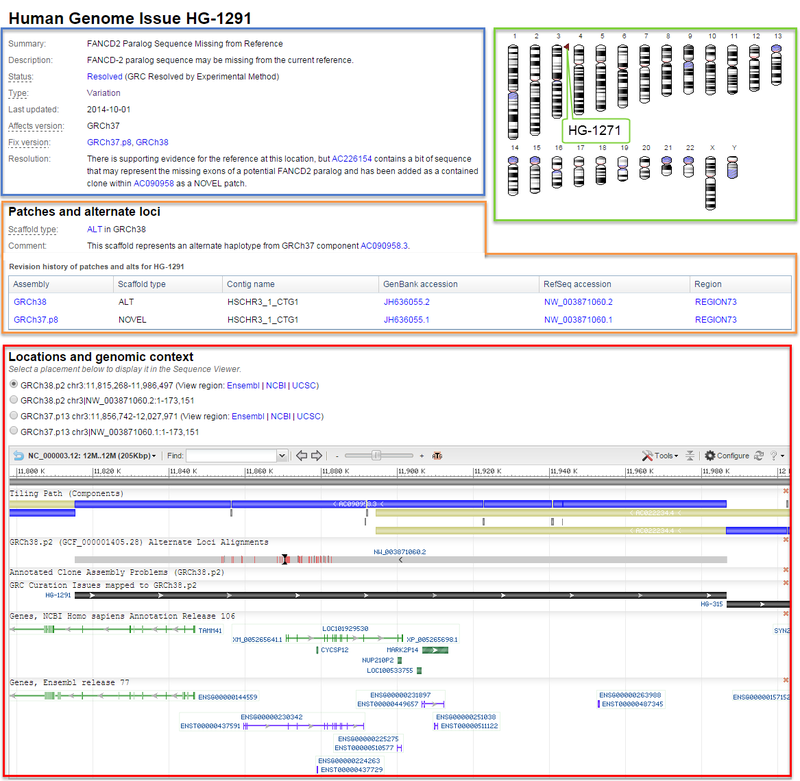 Some of the page features are highlighted in Figure 1, which shows "Human Genome Issues". Show issue locations on (blue box): Use this to define the assembly version on which you want to see mapped issues. We support issue mapping to the current assembly and the last release of the prior assembly version. Ideogram (green box): The histogram above presents the number of issues related to each chromosome, and the annotations show issue locations. Looking for issues related to a single chromosome? Click on a chromosome or histogram of interest to see a more detailed ideogram with annotated issues (more on this below). Search (purple box): Use this to finding issues related to a specific gene/clone/accession number/chromosomal location. Data table: Provides a summary of issues. 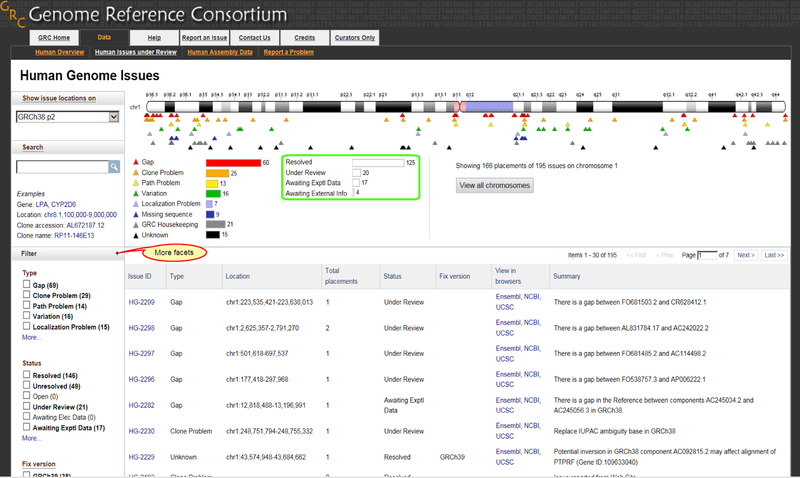 Within this table, click on issue ID (brown box) to go to web pages for specific issues or View in browsers (brown box) to see the relevant genome regions in browsers at Ensembl, NCBI, and UCSC. Filter: Located to the left of the data table, this section contains various display filters, including issue type and issue status, to help you find GRC issues meeting specified criteria. Issue Annotations: In the single chromosome ideogram displays, issues are annotated below the figure. Bar charts: Click on either of the interactive bar charts below the ideogram to re-categorize the issue annotation display by Type or Status.